Well the countdown to Christmas has begun!! 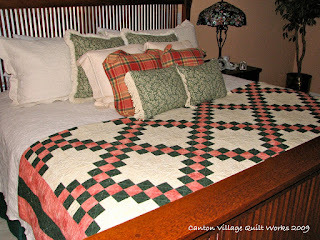 I am still busy here getting customer quilts quilted and back to them. There are going to be some lucky people out there receiving some wonderful gifts this year. I thought it would be kind of neat for you all to see the various ways that I display quilts in my home. 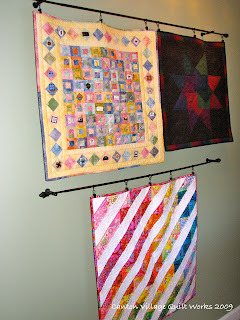 My newest podcast is all about displaying your quilts. You can listen to it HERE or find it in iTunes under Jackie's Quilting Chronicles. If you don't want to listen to me babble on, just stick to reading this post. So this first picture is one of my favorites. For those of you who like the look of a "quilt ladder" but really don't have the floor space then this option is for you. Just take 4, or as many as you like, decorative curtain rods and space them evenly on the wall. Fold your quilts nicely and voila! Instant quilt display. Hmmmm... I feel like I am channeling Karen. By the way, these are just inside my studio. This next display is also just inside my studio. I have two vintage quilts and one of my own quilts neatly folded on this dresser that was mine as a child. 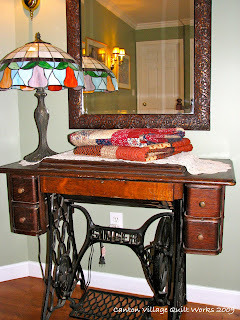 I refinished the dresser and filled it with fabric, what else, right? For the curious, those purses are all samples of the Chloe Bag from Lazy Girl Designs. I taught this as a class at a local quilt shop. This next display is just outside my studio. 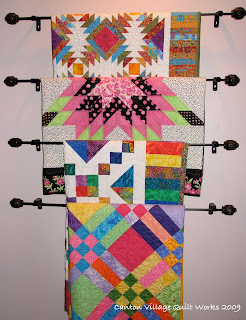 You can just fold multiple quilts over a decorative quilt rack. This display is also just outside my studio. I purchased decorative curtain rods that have the clips. 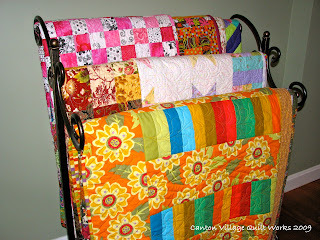 The clips really make it easy to change out a quilt when you want a different look. Do you recognize the Kaffe quilt? 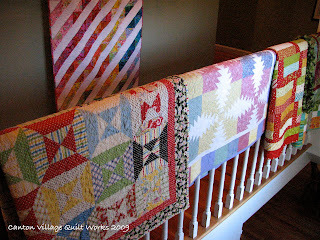 Another thing I like to do is to just hang quilts over a railing and change them out every once in a while. Here is another example of a decorative rod with clips. 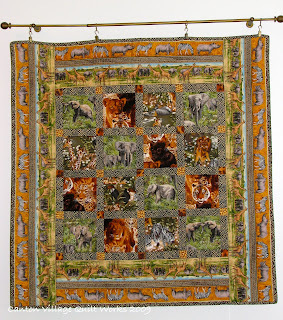 This quilt I made for my hubby commemorating his trip to Tanzania and climbing Mt. Kilimanjaro!! He then went on safari after his arduous climb. 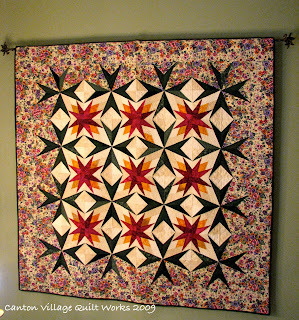 This quilt is hung in my foyer on a decorative rod. But the difference here is that this quilt has a sleeve. No clips on this rod. Welcome to my bedroom! This is how I love to use our quilt. I used a matelasse coverlet and a dust ruffle first. Then I fold our Double Irish Chain at the bottom. We pull it up at night to stay warm. By the way, this quilt was the first one I quilted with my long arm back in September, 2000! It is custom quilted. Here is my grandmother's Singer Treadle (which still works) graced with a doily that she crotched and two folded quilts that I made. When she passed, I was given her machine. It reminds me of her daily. I loved my Nana. 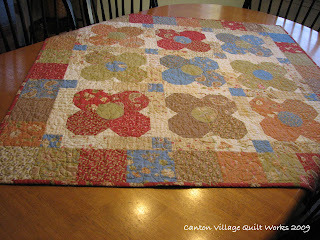 This last way I display quilts in my home is on my kitchen table. This little quilt graces it every day. I love it. I have to also let you know that we use quilts while watching TV and you can always find someone wrapped in one or a kitty laying on a quilt. What can I say, the quilts are well loved in this house. I hope you like the little tour of my home and the quilt displays. 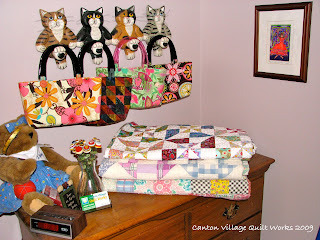 I would love to hear how you display quilts. I am sure there are many ways and I am always up for something new. Don't forget to listen to my podcast.